The trade facilitation center at the “Sinig Korpu” (“Red Bridge”) customs checkpoint at the border with Georgia will be put into operation in late September. 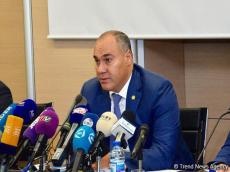 Chairman of the State Customs Committee of Azerbaijan Safar Mehdiyev made the remarks at a press conference on September 12. He went on to say that the opening of the center will significantly reduce the density of citizens when crossing the border, and facilitate the passage of goods and cars through the checkpoint. Earlier, it was reported that Georgia and Azerbaijan with the support of the European Union (EU) are working to improve the customs checkpoint Red Bridge on the Georgian-Azerbaijani border. The project costs Azerbaijan $1.3 million, while the total cost of the project is 3 million euro. The total length of the Georgian-Azerbaijani border is 480 kilometers. In addition to the Red Bridge, Georgia and Azerbaijan are connected with the customs checkpoints Gardabani, Mtkvari, Lagodekhi and Samtatskaro. Speaking of facts of violation, Mehdiyev stressed that in January-August 2018, the Committee revealed 6,155 facts of breach of law, adding that 458 of the facts constituted criminal offenses. He went on to say that over the past period, 150 attempts to transport drugs had been prevented in the fight against drug trafficking. “As a result of our activities, over a ton of narcotic drugs were seized, 169 people were detained, of which 26 women, 37 foreign citizens,” Mehdiyev stressed. Further, Mehdiyev touched upon the customs revenues and said that the Committee plans to exceed the forecast to the 2018 state budget. He noted that the forecast on state budget revenues for the eight months of 2018 has been already exceeded.